Because of your generous support and gifts to Immanuel through Accelerate, we are able to partner with God in the work He is doing around the world. Thank you! Have you ever had one of those “pinch-me moments” in your life? Well, I have! It came this past January when I received a phone call letting me know that I was selected to go on a trip. Not just any trip … but an answer to many prayers and the biggest “pinch-me moment” God could have ever blessed me with. You see, I serve as a year-round volunteer in the Chicagoland area with Operation Christmas Child (OCC – a project of Christian Worldwide Relief Organization Samaritan’s Purse whose mission is to reach children with hope and joy through simple shoe box gifts). I have also been even more blessed to co-lead on the OCC Immanuel Leadership Team, which is awesome. And I get to serve on both of these teams with my best friend (Connie Pfeifer), who has the biggest heart for OCC I have ever seen. It’s awesome! Each year, select year-round volunteers have an opportunity to participate in an international shoe box distribution trip. I was privileged to be chosen this past January. 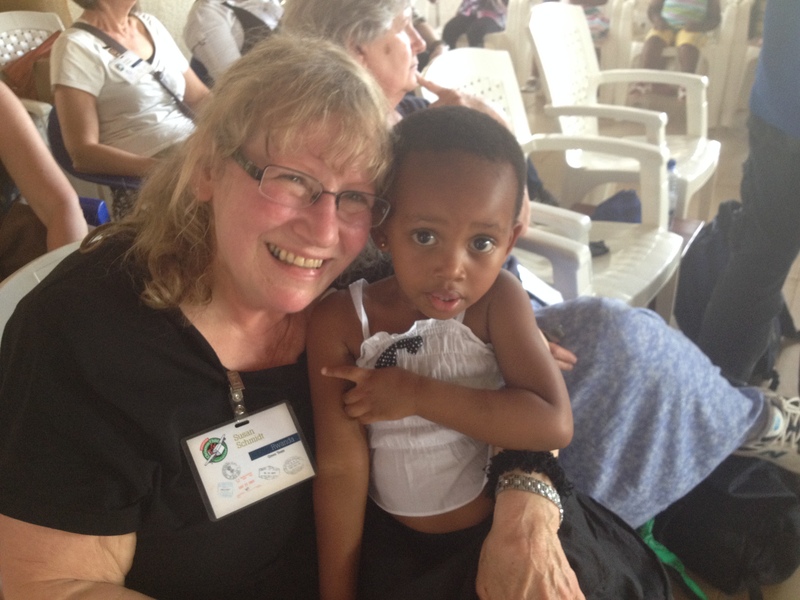 Approximately 40 Operation Christmas Child staff and team members from all over the U.S. traveled to Rwanda from April 26 through May 3. It was such an honor to be selected, the answer to many prayers and the biggest “pinch-me moment” ever. Our group was split into three teams and our “Green Team” would be going on a total of six shoebox distributions handing out these special gifts to children ages 2-14 who had never received anything before. Before ministering to the Rwandan children and local pastors, we first went to the Kigali Memorial to learn about the Genocide that occurred 20 years ago in Rwanda. Learning what had happened to one million adults and children in only 30 days time was very emotional and powerful, but we needed to see and learn where this country has been and where they are today. Most are still healing and others still hurting, so it was an honor to love on the adults as well as the children while we were there. Throughout the week, our team went on a total of six shoebox distributions to children in groups of 80 to 200. We got to be the hands and feet of Jesus, to let them know of a God who loves them so much and how much we love them, too. It was so interesting to see the children react to our light skin and varying shades of hair color. We were so excited to see their beautiful faces and to have the opportunity to smile and laugh together. 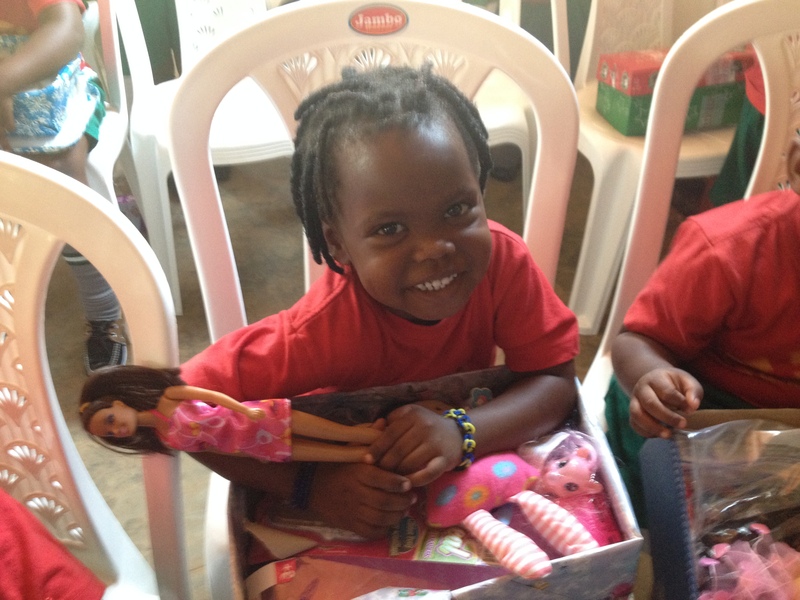 It was especially touching to see their joy at playing with beach balls or to hear the giggles and squeals of delight as they discovered the gifts inside their shoeboxes. 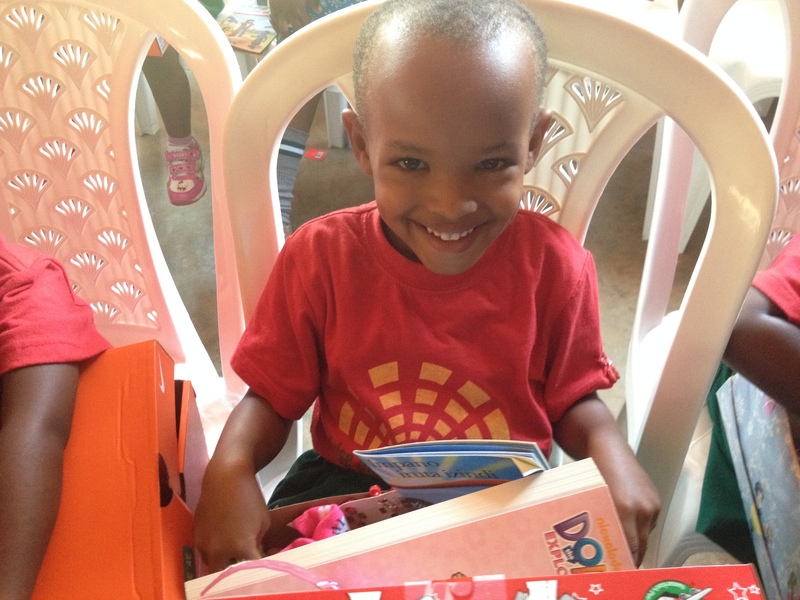 Some of the children received a letter inside their shoebox gift. When time allowed, we would bring over our interpreter who would let the boy or girl hear what we were reading. After that, we would take a picture with the child with the letter (address visible) so that the person that packed the shoebox could receive the picture once we returned to the states and forwarded this information on to the donor. 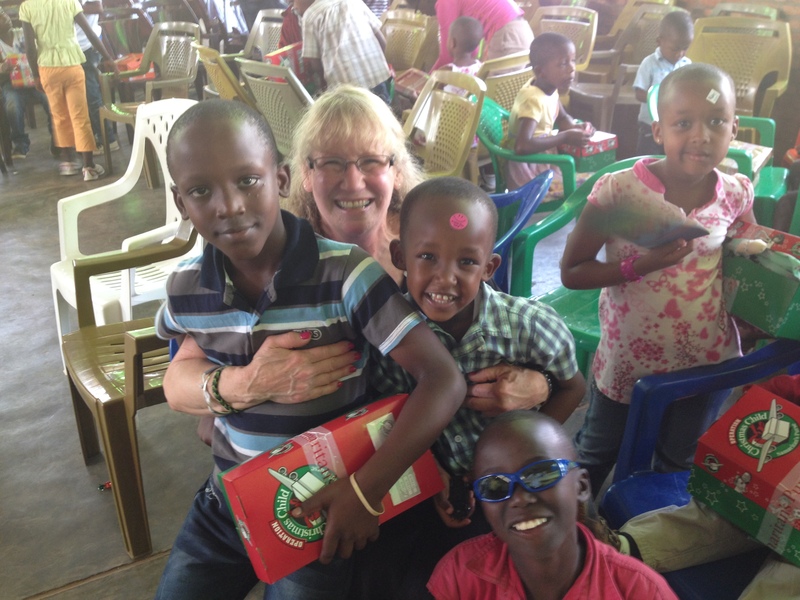 One day, we traveled to The Miracle Center, which was scheduled to have approximately 80 children receiving shoeboxes. Yet when we walked in, there were about 200 expectant children waiting. Would we have enough boxes to give each child one? Knowing what a powerful God we serve, in a short period of time additional cartons of shoe box gifts were located so that each child could receive their special gift. As an added blessing, we went to the Kingdom Education Center School to see two rooms filled with children who were there to be a part of the launching of The Greatest Journey Program, which is a 12-week Discipleship Program for those children that have already received shoeboxes and have chosen to learn more our amazing God. It was so powerful to be there to see them learning about our Savior and how to have a relationship with Him. God used each one on our team in individual ways and blessed each one of us for a lifetime of memories. For each one of us that was humbled and honored to serve alongside the OCC National Leadership Team in Rwanda, it is our hope and next steps that we will share our these experiences with other groups and churches. If you know of any church or small group that would love to hear about Operation Christmas Child and my journey to Rwanda, please let me know. I will be glad to contact them. There are millions more children that need to hear about Jesus and receive him into their heart. Operation Christmas Child is an effective ministry, and I am confident that lives all over the world have been changed by simple shoebox gifts. Yet many churches, groups and individuals haven’t heard about OCC and are not currently packing shoebox gifts as we have been for many years at Immanuel. Please know that each one of the gifts you so lovingly packed are greatly needed, and there are children just waiting to receive them. And what’s even more amazing is that God has already picked out by name the children that will receive your boxes in 2014. YOU can be a part of OCC this autumn at Immanuel! Check out the OCC tab at our World Outreach page to find out more information about our annual Packing Party and other ways YOU can help! Thank you for your note, would love to talk with you regarding the start of an OCC program at Shepherd of the Lakes Lutheran Church, I’ll send you an email and we can talk further. Look forward to talking with you.